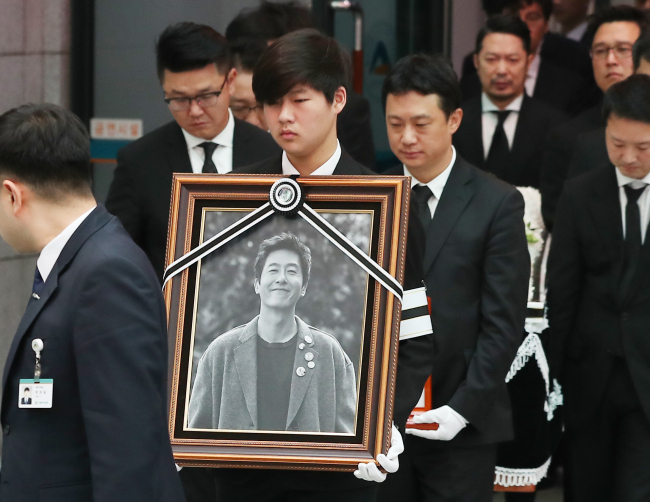 The funeral ceremony of actor Kim Joo-hyuk, who passed away in a car accident Monday, took place Thursday at the Asan Medical Center in southeastern Seoul. The private ceremony was held at 10 a.m. and was attended by Kim’s surviving family, close friends and staff at the actor’s longtime management agency Namoo Actors. A video clip featuring snippets of the late Kim was shown, according to reports. The funeral procession took place at 11 a.m. Following cremation, his ashes laid to rest at his family Columbarium in Seosan, South Chungcheong Province. Many actors attended Kim’s two-day wake held at the Asan Medical Center, including Cha Tae-hyun, who had filmed the travel variety show “2 Days & 1 Night” with Kim, Hwang Jung-min, Jeon Do-yeon, Ahn Sung-ki, Cha Seung-won, Yoo Ah-in, Yoo Jun-sang, Uhm Jung-hwa and more. Song Joong-ki paid his respects on Wednesday, the day after his wedding with actress Song Hye-kyo. Variety program “Running Man” cast members Yoo Jae-suk, Haha, Kim Jong-kook and Lee Kwang-soo also were spotted. Actress Son Ye-jin, who had starred alongside Kim in “My Wife Got Married” (2008) and “The Truth Beneath” (2016) attended the wake as well. Actress Lee Yoo-young, with whom Kim had been in a relationship, made a prolonged stay at the wake. Kim, 45, was driving when he hit another car then veered off the road, sending his vehicle violently flipping down the stairs in front of an apartment complex in Samseong-dong, southern Seoul, Monday. An autopsy Tuesday revealed the cause of death to be a fatal head injury. The actor’s most recent work was TV series “Argon.” Two posthumous films, “Heung-bu” and “Dokjeon” are scheduled for release in 2018.